In the latest case it was determined that three of the victims were infected with the bacterium called campylobacter jejuni while the other four were infected with the parasite cryptosporidium parvum. Exposure to either element typically results in fever, diarrhea, and vomiting. However, for those with weakened immune systems, exposure to cryptosporidium can be life threatening. In June 2010 ABC News reported that 16 people became ill after consuming raw goat milk from a dairy in Longmont, Colorado. Two of the victims in this case were children who required hospitalization. The CDC reported that in just an eight-year period, there were 45 separate cases involving over one-thousand people falling ill after consuming raw milk or cheese made from raw milk. One hundred and four of these individuals required hospitalization and two died from their illness. 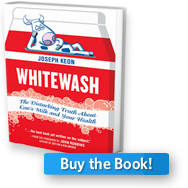 Bacteria is just one of numerous elements that may contaminate milk and that are discussed in Whitewash: The Disturbing Truth about Cow’s Milk and Your Health.